This inherits the danger of missing critical events, or leads to confusion about who taking care of what (“broadcast dilemma”) or creates “alert fatigue”. Both deficits ultimately lead to poor responsiveness when it counts. 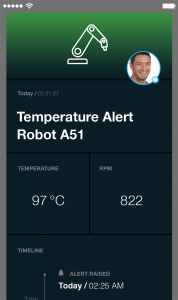 SIGNL4 adds great capabilies for critical mobile alerting to your IoT application. SIGNL4 allows for fully automated and targeted alert notifications to responsible engineers on duty/on call, thus reaching out directly to field service staff. It extends any IoT platform or hardware with mobile real-time notifications considering availability and duties of staff. It notifies persistently by text, voice and mobile push until acknowledgement. And escalates to a management person if an alert is not confirmed in time. SIGNL4 also supports rich and actionable alert messages information, easing the decision whether immediate actions are necessary or not. SIGNL4 lets your operations staff respond much faster and independently of their location. It is the easiest way to send major and critical alerts to your team. At the same time, the SIGNL4 app becomes a “single pane of glass” for all critical IoT signals, alerts and events. SIGNL4 increases uptime of mission-critical IoT installations through a much faster meantime-to-respond. Users of SIGNL4 claim an up to 10x faster response over manual notification processes. SIGNL4 is an out-of-the-box mobile alerting solution for teams in field services and operations. Within minutes you can add mobile alerting and mobile ops capabilities to your IoT application. SIGNL4 empowers mobile workforce and enables anywhere operations. Existing IoT platforms, sensors and devices are connected in minutes. For instance by email, webhook or REST API. SIGNL4 works seamlessly with AWS IoT, Azure IoT, Raspberry, Pycom and many other apps and services.